1. I am the Lord your God, thou shall have no other gods before me. 2. Thou shall not use the Lord's name in vain. 3. Remember to keep the Sabbath day holy. 4. Honor thy Mother and Father. 6. 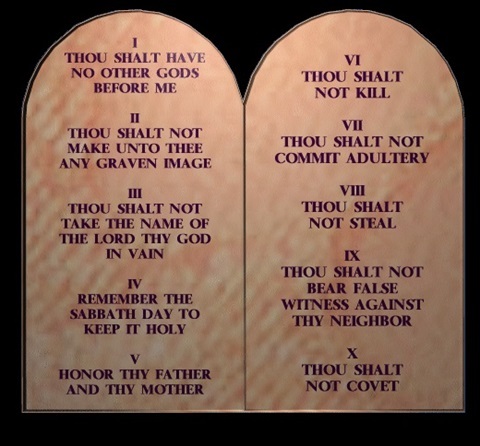 Thou shall not commit adultery. 7. Thou shall not steal. 8. Thou shall not bear false witness of thy neighbor. 9. Thou shall not covet thy neighbor's wife. 10. Thou shall not covet thy neighbor's goods.